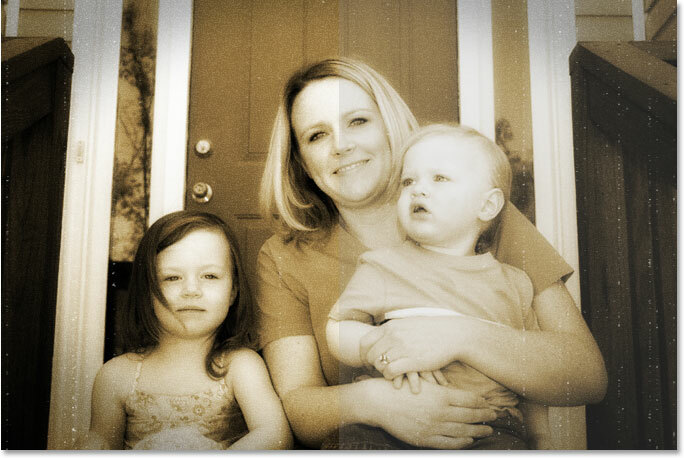 In this Photoshop Effects tutorial, we're going to look at how to do a bit of reverse photo restoration, turning a new or recent photo into an old photo, one that looks like it was taken many years ago, and we'll be doing it by combining several separate effects to create our final result. We'll be looking at how to replace a photo's original colors with a classic sepia tone, how to add a soft glow to an image, how to darken edges, how to add noise, dust and scratches, how to fade an image by brightening the blacks and darkening the whites, and we'll even see how to bring back some of the photo's original color when we're done. Lots of fun stuff! Of course, as with many photo effects, the results you end up with will depend a lot on the photo you're using. If you have a picture of someone sitting in their new 2008 model car wearing the latest fashions while listening to an iPod, trying to make the photo look like it was taken 40 or 50 years ago isn't really going to work, unless your goal is to use the photo as proof that time machines really do exist. The final "old photo" result. Of course, there's lots of different ways to age a photo in Photoshop. This, as they say, is one of them. Clicking on the "New Adjustment Layer" icon at the bottom of the Layers palette. Choose a "Hue/Saturation" adjustment layer. Select the "Colorize" option in the bottom right of the Hue/Saturation dialog box, then set the "Hue" value to around 40. The Layers palette in Photoshop showing the newly added Hue/Saturation adjustment layer. 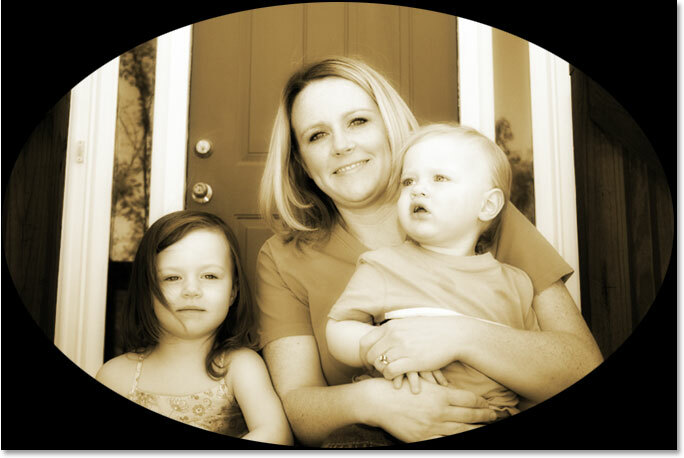 The photo's original colors have been replaced with a sepia tone. The "Merge Visible" option under the "Layer" menu. The Layers palette showing our original two layers now merged onto a third layer above them. Step 3: Rename The New Layer "Glow"
Rename the merged layer "Glow". Of course, you don't have to rename your layers if you feel you don't have that extra 5 seconds of your life to spare, but when you get into some serious Photoshop work where you could easily have hundreds of layers and they all have names like "Layer 10 copy 2" and "Layer 50 copy 7", you'll probably find yourself spending a lot more than 5 seconds trying to find the layer you're looking for. We'll add our glow effect next! Blur the layer using the Gaussian Blur filter. The image now appears blurred in the document window. Step 5: Change The Blend Mode Of The Blurred Layer To "Overlay"
Change the blend mode of the "Glow" layer to "Overlay". The image now appears with a soft glow and with higher contrast. Fine-tune the glow effect by adjusting the opacity of the "Glow" layer. The photo after lowering the opacity of the "Glow" layer. Step 7: Add A New Blank Layer And Name It "Edges"
Hold down "Alt" (Win) / "Option" (Mac) and click on the "New Layer" icon. Name the new layer "Edges". A new blank layer named "Edges" appears at the top of the Layers palette. Select black as the color you want to fill the new layer with. The document window is now filled with solid black. Select the Elliptical Marquee Tool from the Tools palette. Click in the top left corner and drag down to the bottom right corner of the image to create a large elliptical selection. We're going to use our elliptical selection to punch a hole through the solid black fill, allowing us to see our photo underneath, and we can do that by adding a layer mask. Now, whenever we add a layer mask with a selection active, Photoshop uses the selection to determine which part(s) of the layer should remain visible and which part(s) should be hidden. By default, anything inside the selection remains visible, while anything outside the selection becomes hidden from view. That means that if we were to add a layer mask right now with our elliptical selection active, Photoshop would keep the solid black fill area inside the selection visible and it would hide the area outside the selection, which is exactly the opposite of what we want. We want the area inside the selection to be hidden so we can see our photo underneath, while the area outside the selection remains visible. Hold down "Alt" (Win) / "Option" (Mac) and click on the "Layer Mask" icon at the bottom of the Layers palette. The newly added layer mask thumbnail on the "Edges" layer. The photo is now visible through the hole created by the layer mask. Just as a side note before we continue, you may have noticed that this was the third time in this tutorial that we've managed to do something a little differently by holding down the Alt/Option key when we did it. The next time you go to do something in Photoshop, try holding down your Alt/Option key while you do it and see what happens. The worst that will happen is absolutely nothing. But who knows that sorts of little-known features you may discover! 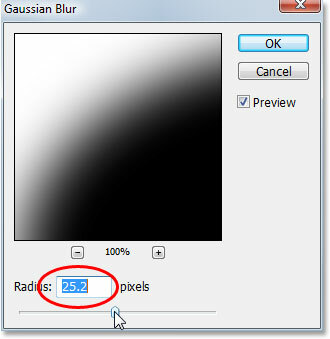 Increase the Radius value in the Gaussian Blur dialog box to soften the transition between the outer black area and the photo. The outer black area now blends smoothly into the photo. Lowering the opacity of the "Edges" layer. The edges of the photo are now darkened. Step 14: Add A New Blank Layer And Name It "Noise"
Name the new layer "Noise". The Layers palette in Photoshop showing the new "Noise" layer at the top. The Fill dialog box should still be set to the same options we used last time. The image once again appears completely filled with black in the document window. Set the "Amount" value to around 130% to add lots of noise to the layer, and select the "Gaussian" and "Monochromatic" options at the bottom. The "Noise" layer is now filled with noise. Step 17: Change The Blend Mode Of The "Noise" Layer To "Soft Light"
Change the blend mode of the "Noise" layer to "Soft Light". 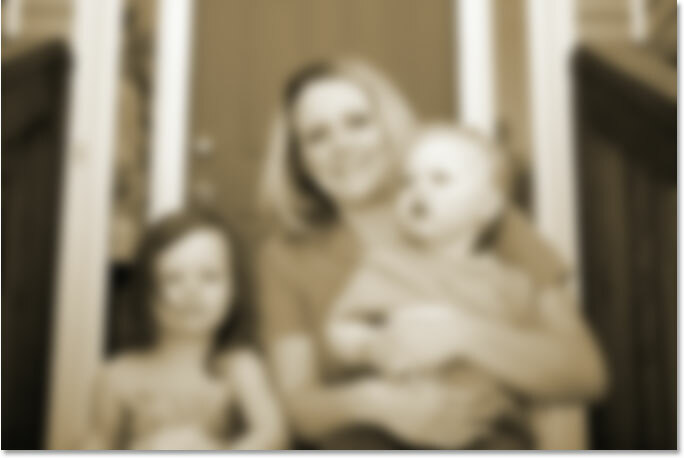 The photo is now visible through the noise after changing the blend mode. Reduce the intensity of the noise by lowering the opacity of the layer. The noise is now much more natural looking in the image after lowering its opacity. Another effect complete! Now let's add a little bit of wear and tear to the image by creating a few specks of dust and some scratches. Nothing extreme, just a subtle amount. We need yet another new layer and we need to fill it with black. Since we've already done this twice, I'll save us a little time here and combine the whole process into one step. Hold down your Alt (Win) / Option (Mac) key and click on the New Layer icon at the bottom of the Layers palette. When the New Layer dialog box appears, name the layer Grain. We're naming it that because we'll be using Photoshop's "Grain" filter in a moment. Click OK to exit out of the dialog box and have Photoshop add the new layer at the top of the Layers palette. Then, to fill the layer with black, go up to the Edit menu at the top of the screen and choose Fill or use the keyboard shortcut Shift+F5. When the Fill dialog box appears, make sure all the options are still set to the way we had them before, with Contents set to Black, Mode set to Normal and Opacity set to 100%, then click OK to exit out of the dialog box and have Photoshop fill the new layer with black. The Layers palette showing a new layer named "Grain" above the other layers, with its preview thumbnail showing that the layer is filled with black. Your image in the document window will also once again be filled with black. Go to Filter > Texture > Grain. Adjust the Grain filter options to create a few broken vertical white lines to use as dust and scratches. The broken vertical white lines are now visible in the document window against the solid black. Step 21: Change The Blend Mode Of The "Grain" Layer To "Screen"
Change the blend mode of the "Grain" layer to "Screen". The image now appears to suffer from a few specks of dust and some scratches. You may be wondering why we named this layer "Grain" and not something more obvious like "Dust & Scratches". The reason is simply because there is an actual Dust & Scratches filter in Photoshop which is used to remove things like, well, dust and scratches. To avoid confusion, I thought it would be easier to name the layer based on the name of the filter we used to create the effect, which was the "Grain" filter. It doesn't really matter what name you give to your layers as long as the name makes sense to you. 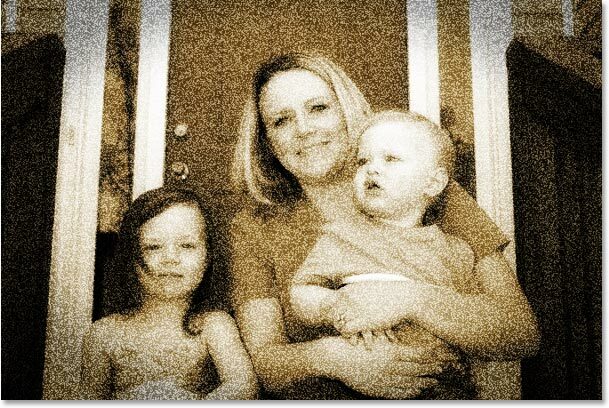 One of the things that tends to happen to photos over time is that they begin to fade. The deep blacks and bright whites in the image become dark and light shades of gray, resulting in a loss of contrast in the photo and an overall "dull" appearance. Normally, Photoshop's Levels command is used to restore those shadows and highlights that have fallen victim to the ravages of time, but we can just as easily use Levels to advance the aging process. Click on the "New Adjustment Layer" icon and select "Levels". When the Levels dialog box appears, look down at the very bottom and you'll see a gradient bar going from black on the left to white on the right, with two small sliders below it on either end - a black one on the left and a white one on the right. These are called output sliders and they control the maximum tonal range of an image. We can use them to control how dark the blacks in an image can appear and how bright the whites can appear. Drag the bottom black slider towards the right until you've set the black Output Level to 30. Drag the bottom white slider towards the left until you've set the white Output Level to 235. The Layers palette showing the newly added Levels adjustment layer sitting at the top. The photo has now lost some of its original contrast. We're just about done, and you could actually stop here if you wanted to. But as a final step, I'm going to bring back just a hint of the photo's original color, and I'll do that next! As I mentioned at the end of the previous page, this last step is optional. I'm going to bring back some of the photo's original color, as if the color in the photo has also faded over time. If you remember from the very beginning of the tutorial, we replaced the photo's original color with a sepia tone using a Hue/Saturation adjustment layer. The original photo with all of its original colors is sitting safely below that adjustment layer on the Background layer. To bring back some of the color, all we need to do is lower the opacity of that Hue/Saturation layer. Select the Hue/Saturation adjustment layer in the Layers palette. Lower the opacity of the Hue/Saturation adjustment layer to bring back some of the photo's original color. And there we have it! That's how to create an old, antique photo effect with Photoshop! Visit our Photo Effects section for more Photoshop effects tutorials!